Calylophus drummondianus var. berlandieri resembles a Primrose or Oenothera spp. that is yellow only with a more bushy and upright growth habit. The leaves are finely textured, almost needle-like. From spring and throughout the summer intense yellow buttercup-shaped flowers will open in the evening and remain open until the next afternoon. Older flowers will fade to a orange-pink color. 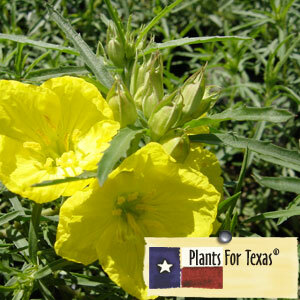 Texas Primrose will grow to a height of 6″ and can spread up to 3 feet. Sundrops does best with good drainage and will tolerate a good amount of heat making it an excellent rock garden candidate. Calylophus drummondianus var. berlandieri also works well as a full sun groundcover as well as a front border plant. To prolong the bloom on Texas Primrose in the summer, remove old blooms and water when dry. Calylophus drummondianus var. berlandieri is part of our Plants For Texas® Program, meaning it was Texas Grown, Tested in Texas to perform outstanding for Texas Gardens.